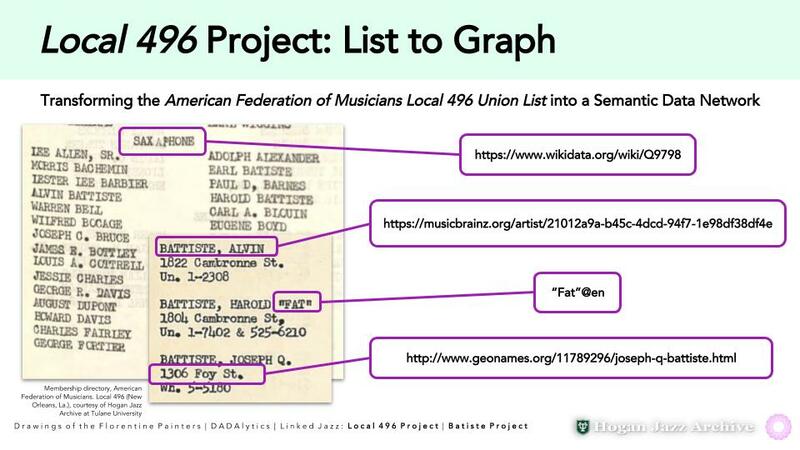 The Local 496 Project is a linked open data effort from the Linked Jazz project developed by the Semantic Lab at Pratt Institute, which is centered on the American Federation of Music’s Local 496 Union List, a mid-century directory of the segregated African-American jazz musicians located in New Orleans held by Tulane University’s Hogan Jazz Archive. The Batiste Project is another effort of the Linked Jazz project, which seeks to research and uncover the familial relationships of the prominent family of New Orleans musicians, the Batistes, several of whom are part of the Local 496 list. 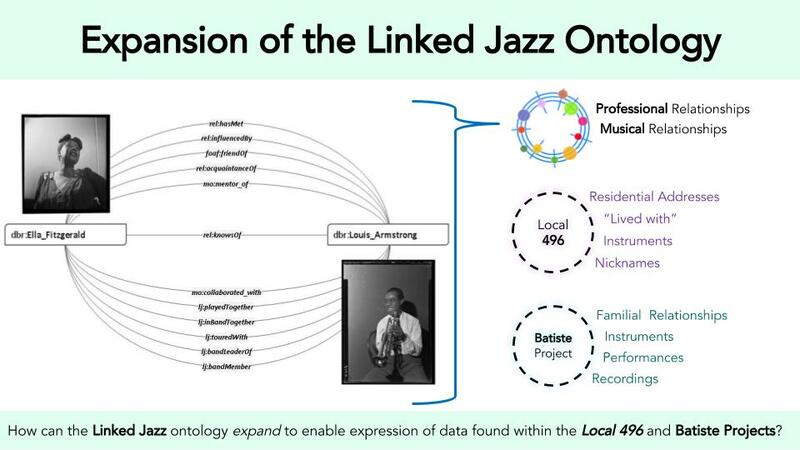 This presentation demonstrates how consideration of the different types of data present in the sources of the Local 496 and Batiste projects can inform the possible expansion of the Linked Jazz ontology. Also presented is the process of collecting and transforming data with the purpose of ingestion into the Linked Open Data cloud. Special consideration is given to how “digital lives” can be established for otherwise “unknown” individuals through the utilization of GeoNames and Wikidata. Slides to the presentation can be found here. Student at Pratt School of Information and member of the Linked Jazz team, interested in the intersection of archival research and semantic web technologies.